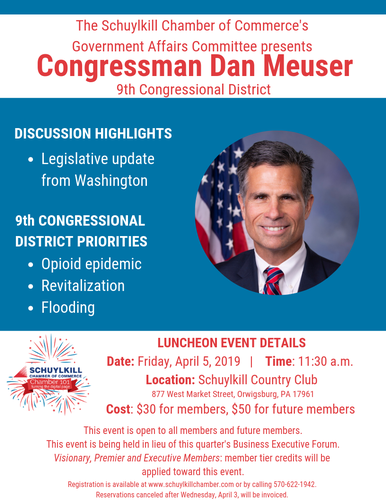 The Schuylkill Chamber of Commerce’s Government Affairs Committee will host a luncheon event featuring special guest, Congressman Dan Meuser at the Schuylkill Country Club in Orwigsburg, Pa. Congressman Meuser plans to discuss his priorities for the 9th Congressional District, which includes revitalization, flooding and the opioid epidemic. He also plans to give a legislative update from Washington, D.C., followed by a formal question and answer period. Member tier credits will be applied for this event for our Visionary, Premier and Executive members. This event is open to all members and future members. Visionary, Premier and Executive members may apply their Business Executive Forum credits toward this event. Cancellations made after Wednesday, April 3, will be invoiced.